My research over two years periodically working with Riverlink, a scientific research consortium within the irrigated horticultural community of Mildura, concluded that three key factors for sustainability are at risk: the earth, the water and the people. 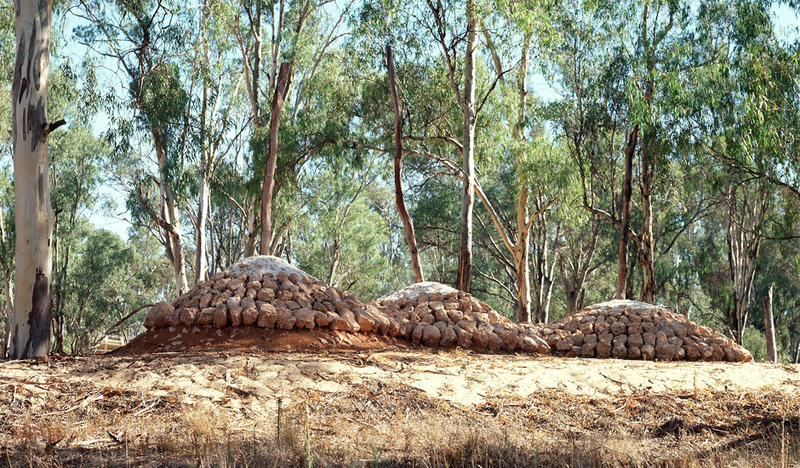 The sculpture is built on a small flood-prone island in the Murray River. Mounds of earth like the waves of arid sand that cover the region are protected, sealed away by a woven stone and steel wire ‘earth blanket’. Copi (gypsum) was used to cap the mounds as a symbol of mourning, referring to the local Aboriginal rites pertaining to death. Shafts of old tree limbs hold and emphasise the mounds. Relevant to the rites pertaining to death according to customs of the largely excluded and dispossessed Indigenous People of this area and with Elders approval the sculpture was designed, materials gained, sited and Copi (gypsum) was used to cap the mounds as a symbol of mourning. Consultation throughout the project was carried out with Barkindji elders Rene Mitchell and Mary Ann Marton and Latjelatje elder Deli Smith.